This game is a way for GMs and gaming groups to create the histories of societies, organisations or families. It is mostly intended to create a rich setting for a campaign rather than as a game on its own, but in my experience it is often so fun that it is no problem of getting players to join in. What is needed is a bit of creativity, a readiness to improvise and some common sense. It is not a rules-heavy system but rather a storytelling system where the participants create the story/history of something. The game is played with a deck of tarot cards and a few ten-sided dice. There is nothing magical about the use of tarot, except that it is good for bringing up associations. 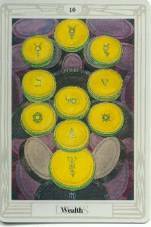 I have used the Aleister Crowley Thoth deck, and would recommend it because the cards both have a rich symbolism and (in the case of the suits) written names giving helpful suggestions for their uses (four of disks is “power”, two of cups “luxury”). It can be run using other decks of course, but often the images are less helpful and the meanings more psychological. Knowing the symbolism and meanings of the cards makes the game far more entertaining and flexible, but just looking at the images can give inspiration. The knight of wands is riding a black horse and carrying a huge torch – a violent warlord. The fool is carrying a sack of coins – an opportunity to swindle. The basic system is simple. Each player represents one group, society, organisation, person or something different. There may or may not be a GM with a final say, although it is useful (as is having somebody as a note-taker if the results are to be used later). Over the span of the game players may join or leave depending on whether their sides are removed or new sides of the story appear (temporarily removed players make good note takers). Unused players may act as “fate” or “chance”, playing cards that represent outside forces. Sometimes the number of sides becomes larger than the number of players, and players or the GM get the chance to play several sides. Each player has a hand of three cards that can be played at any time (but it isn’t polite to interrupt other players, of course – unless it adds to the story). Minor sides and fate players can get just one card (GM’s decision). At the end of each turn the players get new cards so that they again have a hand of three. They can choose to keep cards for future use, or discard unused cards. During the turn cards are played together with explanations of what the side is doing or what is happening. Different cards have different “strengths” – the numbered cards get stronger the higher their number is, the aces, court cards and major arcane all have a strength of 10. Sometimes their strength matters, sometimes not. Politics, societal change, will, ideology. Culture, religion, research and science, civilian society. However, note that the name of the card can be used to change the meaning. Four of swords is “Truce”, making it possible to play it as a military attack or as a peace initiative. 10 of cups is “Satiety” and could mean a period of cultural flourishing and stability, but it could be played to show that someone else has become satiated with their current activity. Two of disks is “Change”, and could be used for nearly anything. The players respond to what is happening by placing their own cards to support, prevent or complicate the meaning of previous cards, or to start their own plots. The GM may intervene with re-interpretation or even disallowing certain things if they do not make sense or fit the aims of the game. For example, a player plays 10 of disks (“Wealth”), saying “Business is good for me”. He then plays ace of wands, continuing “And I buy tremendous political influence with my money”. Another player responds with Princess of Wands: “However, there is one fish you cannot catch. She is a femme fatale, running through your plots with her own agenda”. A third player chimes in, using 2 of wands: “In fact, she is working for me too – she is double-crossing us all”. The first player, playing his last card, The Hierophant: “But there is one balancing factor. She is religious, and does much of what she does in order to protect her own church”. The second player introduces the card Art: “Her church is more than a little heterodox, combining Christianity with alchemical doctrines and chemical sacraments”. The third player plays 10 of swords, “Ruin”: “And this meddling will be her and her sect’s ruin: she angers the wrong person, and he brings down the inquisition on her!”. Trying to save his lady, the second player uses his last card, 5 of Swords (“Dissapointment”): “But she slips away, wowing to bring revenge on all who betrayed her and her faith”. Now the game involves a new side, seeking to attack perhaps one, two or all three other sides. Sometimes a card may be saved, left with the face upright beside the player to denote a resource or thing that is stored for the next turn. Usually such saved cards vanish after that turn, but some might be permanent. For example, a player stating that his fanatic desert tribe is training itself to be impossible to find (7 of swords, “Futility”) stores that card to ward off future attempts to find it. Many of the tarot cards show people. These may be just functions (playing the Priestess to introduce secret information into the game), but could also be handled as persons involved in the story. In that case they can be put aside as reminders and even become new sides with their own players. Especially sword people can be used as “generals” in conflicts, adding their value (10) to the attack the first time they are played. Afterwards they remain in the game, but their value is not used or halved, they are now more important as interesting persons. When persons are introduced they can be fleshed out by drawing cards. Either one draws just one to signify their individuality, or one could draw one to symbolize the good sides and one for their bad sides. For example, the Magus drawn by a player as a great scientist turns out to be motivated by greed (9 of disks) but is also ready to defend his views against overwhelming criticism (7 of wands). Direct conflict is played in basically the same way as the core game, the exception is that dice are used to score how well they are going. Conflicts do not have to be military, it is entirely possible to handle political, economical or cultural conflicts this way, as is elections and scientific competition. Just having two sides quarrelling and interfering is not a conflict of the magnitude that requires this system, but when they go to serious war (or election or whatever) the conflict system takes over. It is imagined to occur on a faster timescale than the basic game (if one turn in the basic game is 10 years, each conflict turn might be a month). Each turn of conflict the involved players play cards against each other. The goal is to play as strong military (I assume in the following that it is a straightforward military conflict) cards as possible supported by good cultural, political and economical cards and various plots. After both players have played all cards they choose, the GM sums their value and both sides roll the value plus one ten-sided die. The higher number has “won” that part of the conflict. The conflict goes on until it is decided who is the winner. In general, if a military attack succeeds with more than 10 it means a major defeat; more than 20 in difference is a crushing blow. Subsequent attacks may be modified depending on past defeats by the GM to keep the situation plausible, or the effects may be just roleplayed. Use a bit of common sense; on average both a superpower and a tiny banana republic will get the same power of cards, but that doesn’t mean the republic has any chance of invading the superpower – a great victory might just be keeping the superpower at bay or causing it grief in the media. In general, non-military minor arcana cards give only half or less of their value to the attack if they are used just as resources. 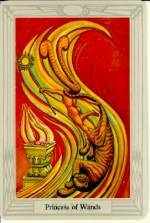 For example, 3 of cups (Abundance) might imply artistic support of the side in the conflict, providing just 1.5 points. But it could also be played on another card like The Sun after the player has stated “we use nuclear weapons” to imply that they use them in abundance – now the entire value 3 is used, or the GM might even decide to increase it further if it fits the situation. They can also be used to signal something completely different, like 6 of wands (Victory) being used as a military card or 3 of swords (Sorrow) to make an opposing leader overcome with grief and unable to lead well. Cards can be used to oppose or even neutralize other cards (one player plays a skilled general, the other plays the Fool to make him insane or subtly incompetent). The Great Game is about the rise and fall of entire nations and cultures. I have used it to play world politics and to come up with interesting science fiction societies. At the start the players decide what groups they represent, perhaps by drawing cards. The game then progresses through turns; I have used 50 year, 25 year and 1 year turns depending on the situation. At the beginning of each turn the GM places one new card in front of each player, representing how well things are going for that side or if something happens. This way random disasters may occur, new leaders or characters appear, etc. If the number of sides isn’t too large (say 5), a card can be placed between each pair of players to see how the relationship between the sides changes. Positive cards may imply more trade, diplomatic relations, scientific collaboration and even alliance, negative cards imply a breakdown in relations or conflicts. Often the interpretation of the meanings is done by both the GM and the involved players, who may place extra cards on the relationship (although sometimes it is best to wait until the entire picture is clear). The small game is about the fate of individuals and perhaps their families. It is an excellent way of finding out “where are they now” of retired PCs and NPCs, as well as inventing family stories for NPCs. It is usually played by one player and the GM (acting as fate), but having several players works fine. Each turn corresponds to a number of years. Either the length is fixed to (say) 10 years, or the player gets to state how long it should be. Having an exciting life (many turns) increases the risk but gives more chances for role-playing. -1 if the player plays some “protective” card like 8 of disks (“Prudence”). +1 or more if somebody plays an attacking card like Death against the character. Person cards can be played to invoke new loves and hates in the life of the character, business partners or children etc. Cups have more of an emotional meaning in this form of the game, and swords might be used to denote reason and action rather than violence if it suits the game. When the character dies, leftover spouses, children, companions and others may be played by the player to continue the saga. The setting is about a conflict between two future nations, Paturia and Nomical. There are three players: the GM, the Paturian player and the Nomical player. The first turn, the GM draws two cards to denote the nations and one for their relationship. Paturia gets Princess of Disks: a remote leader that prefers to work from behind the scenes, interested in domestic matters and wanting to strengthen her nation. Nomical on the other hand has The Fool: no leader at all – they are an anarchy, preferring to let citizens make their own decisions. Between them is the Hermit: neither nation recognizes each other. The Paturian player has 9 of Wands (“Strength”), the Magus and Knight of Cups on hand. 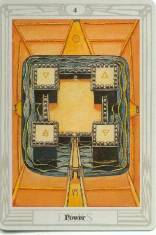 The Nomical player has 3 of wands (“Virtue”), ace of swords and 8 of cups (“Indolence”). She starts by laying down 3 of wands, stating “Despite their lack of central government, Nomical works – people approve of the laissez faire life and wants it to function. There is notable public interest in politics”. Paturia responds with 8 of wands: “Yes, but Paturia is strong! The leader is not just competent, but a brilliant scientist” – puts down the Magus – “and holds the population in a firm grip. They obey and march to her tune”. “Maybe that”, the Nomical player responds, playing 8 of cups, “but it is also a lethargic society. People spend much time hiding their sins and inefficiencies from each other and the government busybodies, leaving little room for initiative”. Paturia plays Knight of Cups: “There is however one person that lifts the spirits of Paturia. An artistic genius that dreams of a great, unified society”. The GM decides to play a card to see what his nature is, and gets The Devil: “While his art and official self are impeccable, underneath it all he is driven by dark desires. He is like Alex in A Clockwork Orange”. Nomical decides to keep the Ace of Swords, and next turn occurs. The Magician and Knight of Cups remains. 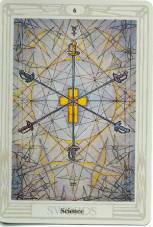 This turn Paturia gets 10 of wands (“Oppression”), Nomical the Wheel of Fortune and between them 7 of Swords (“Futility”). Clearly bad things are happening. The GM explains that the science leader of the Paturia is under the influence of the artist, becoming increasingly oppressive and ready to do anything to further his/her vision of a great Paturia. Meanwhile diplomatic relationships are breaking down and Nomical is in a state of flux: are they ready to go to war to fight for their freedom and what they think is right, appease the expansive Paturians or take up a fight that seems hopeless against the goose-stepping Paturian armies? On his hand the Paturian player has 9 of disks (“Gain”), Princess of Wands and 9 of Swords (“Cruelty”). Nomical has the ace of swords, 5 of wands (“Strife”) and 6 of Swords (“Science”). Nomical starts by playing 5 of wands against Paturia: “the spirit of freedom cannot be bound or stopped by barbed wire borders: Nomical propaganda and sentiments are affecting the population of Paturia too, and there are groups trying to end the oppressive government”. Playing Princess of Wands Nomical responds: “Yes, and political officers to find them and deal with them”. Since the princess (10) is stronger than the 5 of wands (and is supported by the earlier 10 of wands) the GM rules that all dissent is indeed squashed. Ruthlessly, as hinted by the fire and tigers on the Princess card. Paturia regards the outside subversion as a cause of war. Playing 9 of disks and 9 of swords: “We march across the ‘border’ to police the unrecognised areas beyond. We have the best equipment the superior Paturian industry can produce and a ruthlessly nationalistic military”. “Yes, that army is frightening. But Nomical researchers have been working hard, and against the power of SCIENCE!! !” – 6 of swords – “and the unified Nomical people” – ace of swords – “shiny equipment is nothing”. The GM sums the attack values: Paturia 13 (9 of swords plus half the disks), Nomical 16 (6+10). Paturia rolls 4, getting 17, while Nomical rolls 8, getting 24. The difference is 7, a resounding Nomical victory. The GM describes how the Paturian army runs into the automated P2P defences distributed across Nomical, unable to find any central command to shut down. He asks the Paturian player if he wants to back down, but he declines. Next turn of the war Paturia gets 4 of Swords (“Truce”), 10 of Cups (“Satiety”) and 6 of cups (“Pleasure”). Not a particularly war-like hand. Nomical on the other hand gets The Chariot, Ace of Wands and 6 of Wands (“Victory”). Much more cheering. This little exchange could be played as a conflict too, with Nomical having 16+1D10 and Paturia 10+1D10 in political strengths respectively (maybe the Paturian player could find a way of throwing in the 6 of cups to even the odds, but it doesn’t seem useful). The GM simply decides that the ace trumps the others and that Nomical-style world revolution is threatening. The Paturian player makes a gamble (the enemy has just one card and it might not be military) and uses 4 of swords: “Under the ruse of seeking an authority to negotiate peace terms with Paturian forces make a new offensive”. Nomical: “But they did not expect to run into the major Nomical defense AI complex” – the Chariot. Paturia throws the 6 of cups on the Chariot, mostly for effect: “The AI is rather unusual; it is not just intelligent but a highly sensual being”. Rolling the battle Paturia gets 4+1=5, while Nomical gets 10+10=20 (!) – a difference of 15. The GM declares that not only is the offensive force on the run, but Nomical anarchist robots are breaking through the lines into the Paturian capital. Paturia has to sue for peace or be destroyed. The Paturian player, looking at the Magus/Knight of Cups pair, decides that the leadership refuses to yield until the last moment, when they flee to a neutral country. Next turn, the GM has to decide what sides there are. He decides that now there are three sides: the Nomical anarchists, the exile government and that AI, who now is pondering what to do. Drawing cards for them he gets 2 of Swords (“Peace”) for the Nomical – very fitting, the people are settling down for a well earned peace. The exile government gets Lust: they spend the “liberated” parts of the treasury on jet set debauchery together with other deposed dictators. The AI gets The Emperor: it has realized that it is fun to be a king, and wants to be more than just a glorified automated sentry system. The players and GM decides to remove the exile government from the game, and the former Paturian player now runs the ambitious AI. Drawing a card for the relationship between the anarchists and the AI the GM draws 7 of cups (“Debauch”). The AI is corrupting the young, making political promises and generally enjoying itself. Can the anarchists stop the political machine? The meanings of cards are not fixed: it is more important than an action or event makes sense than it fits the card. If a player has a great idea but not the right card, the great idea still works. Applying common sense is important. This game is also a bit of a roleplaying game, even nations have their “personalities” and goals. Whenever you are in doubt about something or want more detail, draw a card to get a hint or more details. Sometimes it is good to save these extra cards as reminders. The table can get rather messy when there are many players; develop some general strategy for where to put cards with a certain meaning (people, important traits of the sides, diplomatic relations, the cards of a conflict, ordinary cards etc). These meanings have cropped up in our games or are based on traditional interpretations. They are just suggestions of how cards can be used, the important thing is that the explanations used in the game makes sense. Innocence. A person goes mad or is stupid. Swindling. Undoing previous card. Cleverness. Communications. Multitasking. Diplomacy. Scientists (mad or otherwise). Secret information. Secret societies. The Moon. The dangerous huntress. Infinity. Balancing forces. Tradition. Welfare society. Prosperous governance. A successful person. Political power. Leadership. A power-hungry person. Alliance. A society interested in peace rather than conflict. A mistress. Space shuttles and other transport vehicles. A military leader making good plans. Law and order. Adapting to circumstances of the environment. Isolationism. Wisdom. Prudence. Retirement. Old people. Taking a gamble – depending on the next card drawn from the deck things go doubly well or doubly bad. Sensualism and debauchery. Joy of life. Pleasure droids. Blocking something. Decapitating enemy leaderships. Bureaucracy. Death. Bioweapons. Assassination. Reversed: life extension treatments, undead. Transformations. Combining opposites. Cyborgs. Genetic modifications. Syncretist religions. Total disaster. Cthuloid monsters. Combat. Revolution. Paradigm shifts. Space. Looking for remote answers. Isolationism.Hope. Secret enemies. Subconscious urges. The construction of large towers. Energy. Rebirth. Children. Building a safe fortress. Nuclear weapons. Day of judgement. Birth of something new or a historical person. Space. Virtual reality. Generally strengthen another card enormously. Renaissance. The Holy Grail. Emotional ecstasy. Water. Abundance of something. Material wealth. Satiety. Absence of change. Utopism. New ideas. Artistic genius. Ocean farming. An emotional dreamer. Steam engines. Drinking too much. Moody and turbulent people. A secretive woman. Emotional manipulation. Mysticism. Military might. Total focus. Willpower. Leadership. Air and space. Justice. Grief. The death of a loved one. Failure. Deceit. Science. Balancing religion and reason. Interference. A plan is sabotaged. Bad luck. Cruelty. Agony. A hopeless situation. Elaborate and convincing lies. An opionated intellectual. Frank or rude people. Direct action. Mathematics and science. A samurai. An unstable genius. Lots of ideas and plans. Contradictions. Fanaticism. Honest leadership. Astute thinking free of illusions. Intelligence agencies. Removing masks. A protector. Making ideas real. A valkyria. A practical and troublesome leader. Material wealth. Supremacy. Atomic power. Earth and biosphere. Industry. Hard work. Everything going along the plan. Power. Energy production. Law and order. Defenses. Failure. Waste of resources. Oilspills. Delays and sloth. Prudence. Industry. Applying intelligence to practical matters. Wealth. Success and material power. A doctor or biologist. Agricultural management. A protector. A navigator. A determined planner. Logic. Material progress. An implacable foe. Keeping the outside world in check. A secure person. Planning for desert journeys. Kind but suffocating. A shy but competent person. Political supremacy. Ideological fanatism. Fire. Oppression. Purges of internal dissenters. The black knight. A sociopath. Adventure. Restlessness. A hot-tempered leader. A friendly, active person. Movement and taking charge. Racing cars. The white knight. A popular leader. Energy. Self-confidence. Unashamed sensualism. A femme fatale. A daring young politician. Somebody who is entirely unafraid.